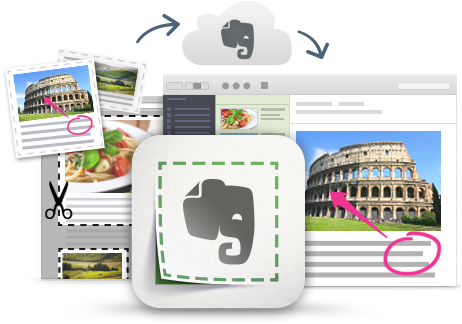 The Evernote Web Clipper is an extremely useful tool to use with Evernote. It allows you to clip articles, text, images, PDF files and more all from your browser. Simply install the browser extension and then click on the Icon when you want to clip something. You can clip an article, a selection, a simplified article (gets rid of ads and such), the full web page, a bookmark (great option over a separate bookmark tool) and even a screenshot. If the "web page" is a PDF file being viewed, it will clip that. Links in the page are kept live too. In Gmail, it will clip the email you selected. You can select the notebook and any tags you want to use right in the clipper interface and even set a reminder there. You can even add a remark - maybe why you clipped it. This is great for saving web pages and articles for research, curating (great for web pages that disappear after a while), future use, or bookmarking. I also use it to clip resources to use with my classes and consulting. There is even an Evernote Clipper for Exchange, allowing you to clip emails (with attachments) right into Evernote. 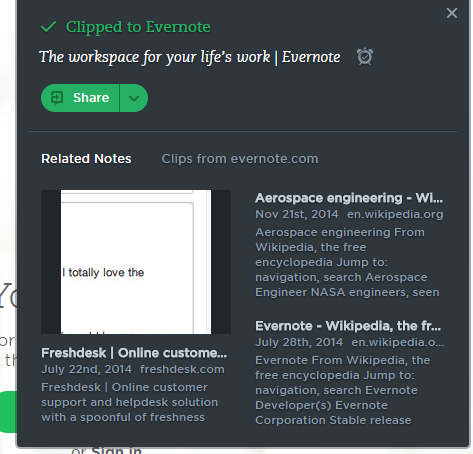 After you clip something, the Clipper window will also show you 3 notes that are related to what you just clipped - great for realizing you already clipped that article or finding something you forgot you clipped. Just like anything you capture in Evernote, you can annotate your clippings (that's a future tip).